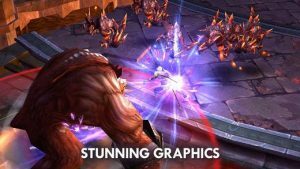 Experience intense real-time combat as you hack, slash, and blast your way through a vast fantasy world! Party with friends to raid treacherous Dungeons or clash against rivals in the Arena and large-scale PvP Battlegrounds. Upgrade and transform yourself from a fledging warrior to an unstoppable God of War! Content: Subscribers can get an Epic pet every month, and other great bonuses with a total value over 20,000 Diamonds. Auto-pay: Subscriptions will be charged to your credit card through your iTunes account. Your subscription will automatically renew unless canceled at least 24 hours before the end of the current period. You will not be able to cancel the subscription once activated. Manage your subscriptions in Account Settings after purchase. The only way to become a stronger in this game is to buy your way up. The strongest player spent the most money, so his ranking will never be outranked. You guys need to even out the playing field, it’s okay to give a little of advantage, but this is too much. The crazy part about its only one person controlling all the outcomes and gets the same rewards that keep him overpowered. Also, you guys need to stop with all those fake advertisements about how these characters look for gear or we jump off mountains. Also, you guys overprice these VIP prices, these prices are way to high to be getting these things.